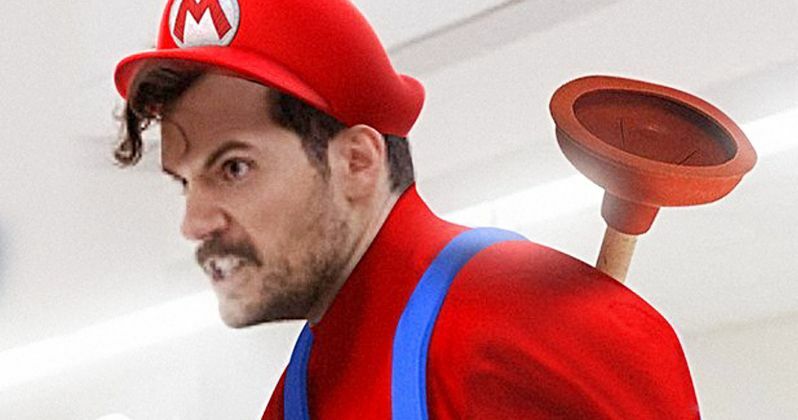 BossLogic's latest work of art is Henry Cavill preparing for battle as Nintendo's Mario in a fictional Super Mario Bros. or Super Smash Bros. movie. The crossover brawling game has been a huge hit for Nintendo since the franchise started in 1999. Originally, the game was a Japan-only title, but its popularity made the gaming company decide to release it worldwide. The game gained even higher acclaim when Super Smash Bros. Melee was released for the GameCube in 2001, quickly becoming the best-selling game in the history of the console. Obviously, there's no Super Smash Bros. movie in development, but that could change in the future, especially since BossLogic has taken Henry Cavill's Mission: Impossible 6 mustache and used it far better than anyone has seen. Cavill looks like a perfect Super Mario, dressed in his trademark blue overalls and white gloves. The artist used a still from the latest promotional material of Cavill's Mission: Impossible 6 character getting ready for a serious fight. If the look wasn't great enough on its own, BossLogic even threw a toilet plunger in for good measure. Henry Cavill's mustache has been making news ever since Justice League was released late last year. The actor was not allowed to shave his mustache for the reshoots of the superhero film as he was under contract for Mission: Impossible 6. So, DC Films and Warner Bros. had to famously go in and digitally remove it, which looked really weird and almost like they spent about $100 in total. However, it was not as weird as those Nintendo fans who digitally removed Mario's mustache. That was just plain creepy. Development for the Super Smash Bros. first game started back in 1998 with an idea to have a fighting game with a bunch of Nintendo characters from different games. It was originally going to be called Dragon King: The Fighting Game, but that video game title was later ditched for Super Smash Bros. Collectively, all of the games have sold nearly $50 million copies worldwide and they almost always have positive reviews from fans and critics. The Super Smash Bros. is often one of the most highly anticipated games for a Nintendo Console, often moving more units than a Zelda or Super Mario Bros. game. While there's currently no talks about bringing the Super Smash Bros. franchise to the big screen, it's not too far of a stretch. But, it doesn't really sound like a movie that too many people would want to see on the big screen, though it would probably be a lot better than the Street Fighter and Super Mario Bros. movies combined. For now, we'll just have to look at the incredible artwork of BossLogic to imagine how cool Henry Cavill would look as Super Mario in some kind of big screen adaptation. You can check out the artwork below, provided by BossLogic's Twitter account.